Before I was a rapper and producer, I was just a producer; so you can imagine my excitement when my boss gave me the go-ahead to throw a beat battle next month. 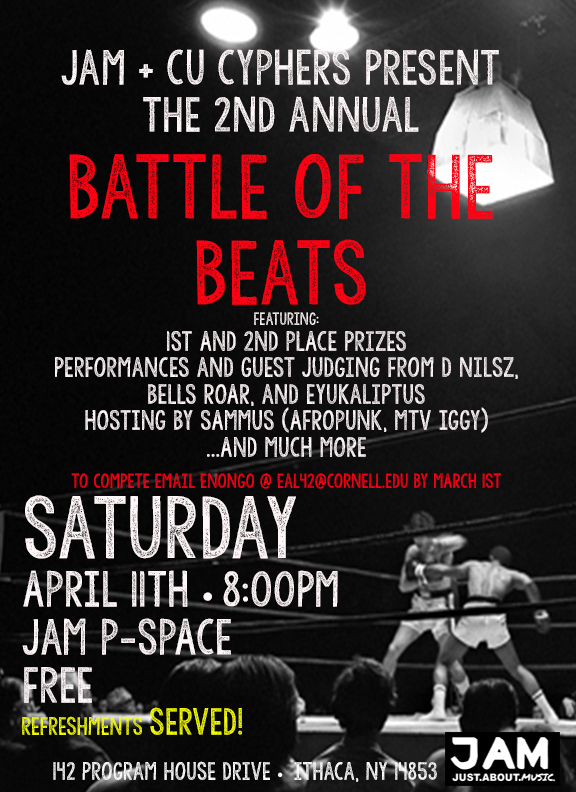 That’s right — on Saturday April 11th I will be hosting Just About Music’s 2nd Annual Battle of the Beats in the performance space [142 Program House Drive]. The event starts at 8:00pm and is totally free plus refreshments will be served — it will also include performances from my labelmate D Nilsz as well as extremely talented artists Eyukaliptus and Bells Roar. RSVP on Facebook HERE and I’ll see you there!